The Raging Tide stars Richard Conte as San Francisco crime boss Bruno Felkin. After killing off a rival, Felkin tries to arrange an alibi with his girlfriend Connie Thatcher (Shelley Winters). Unfortunately, she isn't available, obliging Felkin to hide out on a fishing boat owned by Ilmael Linder (Charles Bickford) until Connie can be located. Far from the perfect guest, Felkin tries to inveigle Linder's son Carl (Alex Nicol) into doing his dirty work until the heat's off. Gradually, however, Felkin, and by extension Connie, are reformed by the essential decency of the Linder family -- though pursuing cop Kelsey (Stephen McNally) might not see things in this new light. 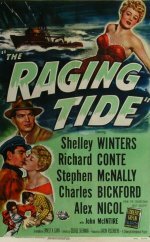 The Raging Tide was based on Fiddler's Green, a novel by Ernest K. Gann.